No place or space is off limits in the world of flexible work — especially for organizations embracing this trend that is at the heart of the future of work. Kingfisher’s office looks more like a cool café or lounge than an office and offers a mix of different space options for many kinds of work. Image courtesy of JLL. Who doesn’t want to be in the driver’s seat of their own experience at work? Perhaps you will catch some focused time at a quiet workstation at the office, then head to a meeting in the office café, and catch your breath in the meditation room. Perhaps tomorrow, you’ll head to your neighborhood coworking space, after working from your kitchen table in the morning. No place or space is off limits in the world of flexible work— especially for organizations embracing this trend that is at the heart of the future of work. Flexibility has natural human appeal, but this phenomenon is not just about indulging in simple employee perks. Investing in flex work programs can create workplaces that are as flexible and dynamic as your business itself—and its competition. The potential is realized at organizations of all sizes. At JLL, we predict that 30 percent of all office space across the board will be flexible, on-demand space by 2030. And the world’s leading organizations will get there even faster: According to our new, still unreleased survey of 500 corporate real estate leaders at large, global firms, the shift will come sooner by 2020. WPP created an open, light-filled environment that is easily malleable, creating a more private temporary meeting space in the middle of the open office when needed. Image courtesy of JLL. There are many “scientific” reasons flex work trends are prevailing, from its proven use in the war for talent to its potential for long-term cost control. But perhaps first and foremost is the sheer fact that nothing stands still in the Fourth Industrial Revolution—including the places we work. Whether we’re talking about truly mobile meeting rooms, coworking partnerships, more flexible lease terms, or which app to use for onsite room reservations, workplace programming must be dynamic and flexible if it’s to keep up with the speed of technological advancement and employee preferences. A smart, agile flex work program can keep organizations at the forefront by triggering creativity, engaging workers, and organically shaping collaboration, while enabling more agile cost control. Consider, for example, the fact that most corporate space is underutilized 60 percent of the time. Those empty desks can mean a significant financial opportunity, given that real estate is typically the second or third-largest item on a balance sheet. A flexible, data-driven strategy that can be adjusted on the fly as your business needs change thwarts the “empty desk syndrome,” ultimately driving financial flexibility. Plus, a holistic, integrated approach to work and space can help win the war for talent. For one thing, flex work allows companies to capture the coveted innovation cultures of startups and coworking companies, but in a way that aligns with their business goals and culture. This new way of thinking can help attract and retain employees and contractors alike, which is important considering the Gallup poll finding 36 percent of U.S. workers have a gig work arrangement in some capacity. Flex work can also help organizations stay ahead through the unprecedented, chronic labor shortage facing the U.S. economy—by helping keep more women in the workforce. As of January 2018, roughly 6.3 million positions remain open but unfilled—a record high. Meanwhile, roughly 4.7 million college-educated women are currently not working during their childbearing years, which is significant considering women hold the majority of college and advanced degrees in the U.S. According to our analysis, flexible work schedules could help enable more working parents return to work sooner. Finally, and this may come as a surprise: it’s actually cheaper to build engaging, flexible workspace than it is to invest in traditional office space designs. Currently, tech-style space fit-outs in the U.S. cost an average 15 percent less than conventional office space. The above-mentioned advantages aren’t pie-in-the-sky possibilities; they’re all within reach for organizations that take proactive steps toward flexibility now. This serene workplace looks more like a spiritual retreat than an office with cushioned bench seating, eye-catching lighting and the right technology to ensure it is practical. Image courtesy of JLL. Adopt this mantra: There’s no one-size-fits all solution, even within a single organization. Look for ways to strategically align flexibility with your unique business goals and worker desires. Non-traditional spaces, like coworking and unique flex space, look different in every organization, for every office culture. For every business need, there is an ideal space and time. Work priorities evolve constantly, and so should be the opportunity to fulfill them. A flexible, people-friendly workplace will offer a mix of worthwhile choices, from quiet rooms, huddle rooms and coffee lounges, to traditional desks in neighborhood configurations. It also makes it easy to work outside the organizational footprint, like coworking spaces, home offices, or anywhere in between, by offering the right technology solutions. Invest in the right technology. Smart building and smart workplace tools can directly support flexibility goals by enabling people to customize their workspace, say, by simply adjusting temperature or lighting in their workspace du jour, or easily reserving a conference room by app. Sensor-rich environments, along with strong data and analytics, can also help you gauge which types of space are preferred, or not, and invest in more of the former. Put the human experience first. Flexibility alone isn’t going to cut it in today’s competitive markets. To succeed, flex programs must be created with your organization’s people first and foremost. According to JLL research, 87 percent of employees worldwide say that having a Chief Happiness Officer in their workplace would be a good idea. Whether or not your organization employs a CHO, focusing on what your employees say about and want in the workplace is the most important element of implementing an effective flex program. Invest in flexibility. Every real estate decision can contribute to flexibility goals, from leasing strategy that prioritizes short-term leases and other off-site space options, to procurement plans that include convertible furniture and movable walls. 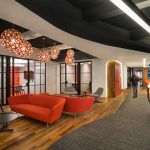 Designed carefully, more flexible spaces—both inside and outside the organizational footprint—can help employee preferences come alive, spark innovation and fuel insight. Is your real estate portfolio as dynamic and flexible as your business? The answer, increasingly, is that it could and should be.